During the summer of 1899, Sans Souci opened as one of Chicago’s first amusement parks and covered a double city block. Its main entrance was the corner of Cottage Grove and Sixtieth, later to be the exact location of Midway Gardens. Unable to remain profitable, the property was lease by another group of investors, one of which was Edward C. Waller. Jr. Because of his father’s prior involvement with Wright (S.030, 031, 047, 065, 066, 166), he was instrumental in commissioning Wright as the architect of their new endeavor. Although Wallace was instrumental in selecting Wright, Midway Gardens was pure Wright, and pure genius. The design and the details are spectacular and ornate. Eye Candy. Much has been published about Midway Gardens. How do you describe such a complex building in a few short paragraphs. 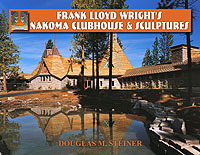 Paul Kurty’s “Frank Lloyd Wright and Midway Gardens” 1998, is essential in understanding this elaborate work of art. 600 feet by 600 feet, Midway Gardens was an indoor and outdoor facility. 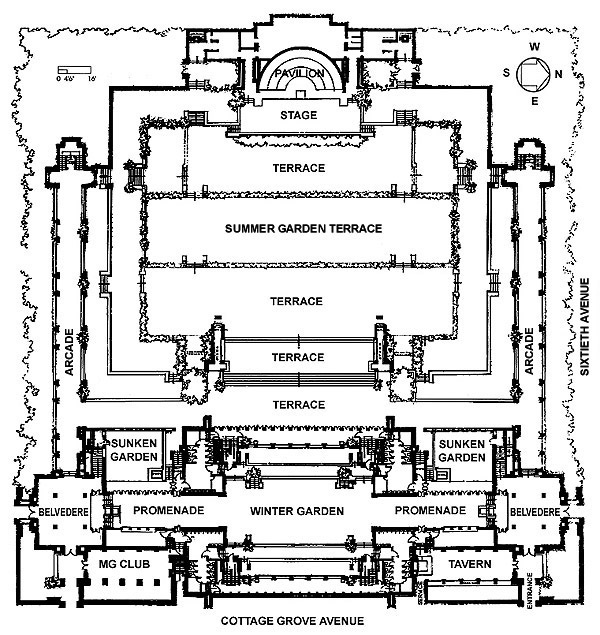 It was comprised of a music pavilion and stage, arcades on either side of the terraced summer gardens, an indoor lobby, club, tavern, two belvederes, promenades, cigar concession stands, two sunken gardens and pools, dance floors, cantilevered balconies, terraces, gardens and courtyards. He used bricks and concrete blocks with designs. Wright not only designed the building but also the wall murals, concrete block designs, windows, tables, chairs, lamps, graphics and dishes. He also designed the many different sculptures and capitals. 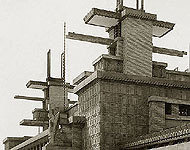 John Lloyd Wright worked in his father’s office, prepared many of the working drawings and acted as superintendent of construction. Wright worked with two sculptors, Alfonso Iannelli and Richard Bock. Ezio Orlandi was responsible for casting. A heated dispute arose between Wright and Iannelli as to who was responsible for designing the many sculptures or as they were later called “sprites”. On August 14, 1914, while Wright was completing Midway Gardens, word reached him about the disaster in Wisconsin. A cook set fire to Taliesin and murdered Manah, her two children and four members of Wright’s architectural staff. Wright left for Wisconsin. Although success at first, Midway Gardens struggled financially. After only two years, on May 31, 1916, Midway Gardens was sold to the Edelweiss Brewery, turned into a beer garden and renamed "Edelweiss Gardens." After struggling, the final blow came in 1920 when Prohibition was declared. 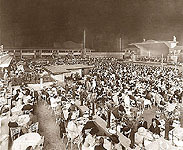 Ownership continued to change hands and on August 31, 1921 the property was sold to owners of the E. C. Dietrich Midway Automobile Tire and Supply Company and became the "Midway Dancing Gardens". In October of 1923, the Winter Garden was revised and enlarged by removing balconies (Kruty P47, F44). The four large male and female sprites (Cube, Octagon, Triangle, Sphere) were moved out into the Summer gardens. Benny Goodman even played there in 1924. In the spring of 1929, the building was leased to its final owner, Sinclair Filling Station & Car Wash. The building was finally demolished in October of 1929. Midway Gardens was bulldozed into Lake Michigan as break wall. The building didn't go down without a fight. Two wrecking companies went out of business trying to demolish the concrete structure. The company that finally demolished Midway Gardens lost a considerable amount of money on the job. There are many classic Wright details. The basic material are brick and patterned concrete blocks. There are cantilevered and trellised roof overhangs and cantilevered balconies, decoratively designed metal fascia cornices. Horizontal lines, columns, hidden entries, horizontal rows of leaded glass windows and rows of leaded glass doors that open outward, vases, light trees, pedestal bases and sculptures, many, many sculptures. Text by Douglas Steiner, Copyright 2008. Original drawing of the Midway Gardens, Copyright The Frank Lloyd Wright Foundation, Scottsdale, AZ. Henry Fuermann & Sons documented many of the buildings in the Chicago area. These Midway Gardens images they photographed in 1914 are an invaluable record of Wright's Masterpiece. 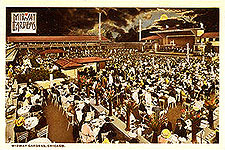 The images are the most complete record of Midway Gardens as Wright envisioned it. This is not a complete set of images, we will include any additional images we are able to acquire. 1) Sans Souci Amusement Park opened as one of Chicago’s first amusement parks and covered a double city block. 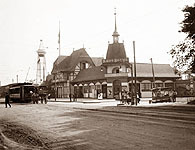 Its main entrance was the corner of Cottage Grove and Sixtieth, later to be the exact location of Midway Gardens. Photographed 1908. 2) Summer Garden at night, photograph by J.W. Taylor, Chicago, 1914. 3-5) Three Midway Gardens postcards published in 1915. 6-7) Two photographs of the Midway Dancing Gardens 1925, photograph by Gilman Lane. 8) Midway Gardens Stain glass window reproduction. This is a very important set of images that document the changes to Midway Gardens. In October of 1923, the Winter Garden was revised and enlarged by removing balconies (Kruty P47, F44). The four large male and female sprites (Cube, Octagon, Triangle, Sphere) were moved out into the Summer gardens. The most important image in this set is the fountain (#11). In Kruty’s “Frank Lloyd Wright and Midway Gardens”, page 136 he states that “Although no known photographs show the promenade’s interior and, thus, the site of either fountain, it is possible to get some idea of their forms from drawings and fragments.” This may be the only image of the fountain that exists. Courtesy National Library of Australia. Wright designed many decorative details for the Midway Gardens. Was this silver dish (lower left) produced for Wright's Midway Gardens or another? That was the question we attempted to unravel. We did an extensive search through everything that was published about the Midway Gardens. We also contacted the Meriden Historical Society. "Wendingen - IV No. 11", 1921, Berlage, H. P., page 2-9, 18. "Wendingen VII No. 5", 1925, Wright, Frank Lloyd page 63-76. Introduction by Wijdeveld, H. Th., 1925 &1948, page 63-77. 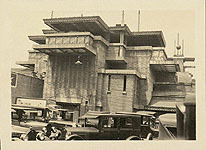 "The New World Architecture", Cheney, 1930, photograph page 215. "Two Lectures on Architecture", Wright, 1931, photograph page 29. "Modern Architecture: Museum of Modern Art. International Exhibition". Hitchcock, 1932, page 34. "An Autobiography" Wright, 1932, page 178-190. "Frank Lloyd Wright On Architecture" Wright, 1942, page 188. "The Nature of Materials: 1887 - 1941", Hitchcock, 1942, pages 53, 61-64, 66-67, 69, 102, plates 191-198. "The Work of Frank Lloyd Wright", Introduction by Wijdeveld, H. Th., 1948, 1965, page 63-77. "Frank Lloyd Wright / Sixty Years of Living Architecture" Moser, 1952, page 18-20. "Sixty Years of Living Arch. The work of Frank Lloyd Wright" Wright, 1954, 1956, pages 2, 6-7. "An American Architecture" Wright, 1955, pages 60, 96, 220. "A Testament" Wright, 1957, page 114-121. "Frank Lloyd Wright, Rebel in Concrete" Forsee, 1959, pages 62-66. "Drawings for a Living Architecture" Wright, 1959, page 152-153. "The Master Builders: Le Corbusier, Rohe, Frank Lloyd Wright" Blake, 1960, page 323-325, 327. "Frank Lloyd Wright (Masters of the World Series)" Scully, 1960, pages 21, 22, plates 49-50. "Frank Lloyd Wright: Writings and Buildings" Wright, 1960, pages 119-120, 186-187. "Frank Lloyd Wright: A Biography" Farr, 1961, pages 132-135, 138, 145, 151-154, plate 15. “The Midway Gardens, 1914 - 1929" Fern, Iannelli, Wright, Wright, 1961. "The Drawings of Frank Lloyd Wright" Wright, Drexler, 1962, pages 48, 282-4, 294-295. "Architecture, Man in Possession of his Earth" Wright, 1962, page 28. "Four Great Makers of Modern Architecture: Gropius, Le Corbusier, Mies vander Rohe, Wright" Kaufmann, 1963, page 32-33, 36. "Frank Lloyd Wright America’s Greatest Architect" Jacobs, 1965, pages 65a, 77-84. "Architects on Architecture: New Directions in America" Heyer, 1966, page 64. "Frank Lloyd Wright: A Study in Architectural Content" Smith, 1966, page 108. "Frank Lloyd Wright" Bardeschi, 1972, page 22. "Frank Lloyd Wright: An Interpretive Biography" Twombly, 1973, page 112, 121-126, 135, 139, 282. "In the Cause of Architecture" Wright, 1975, page 44-45, 121. "Frank Lloyd Wright: Three Quarters of a Century of Drawings" Izzo, Gubitosi; Pfeiffer; Angrisani, 1977, 1981, page 34. "Frank Lloyd Wright Kelmscott Gallery", Elliott 1981, page 33-37. "Kings of Infinite Space" Jencks, 1983, page 35. "Frank Lloyd Wright and The Prairie School" Brooks, 1984, page 21, 23, 105-106, plates 76-78. "Frank Lloyd Wright: Architectural Drawings and Decorative Arts" Hanks, Toher, Graf, 1985, 17, 72-73. "Frank Lloyd Wright and Viollet-le-Duc" Kelmscott Enterprises, 1986, page 68-69. "An American Genius: Frank Lloyd Wright" Einbinder, 1986, page 126-127, 132-139. "Frank Lloyd Wright: In The Realm of Ideas" Pfeiffer, Nordland, 1988, page 15. "Memories of an American Artist: Richard W. Bock", Pierre, Dorathi Bock. 1989. "9 Commentaries on Frank Lloyd Wright" Kaufmann, 1989, page 99-102. "Frank Lloyd Wright Drawings. Masterworks from the Frank Lloyd Wright Archives" Pfeiffer, 1990, page 7, 130, 173, 178, 289-291. "Frank Lloyd Wright" Zevi, 1990, page 96-99, 262. "Important 19th and 20th Century Architectural Objects and Designs" Hindman, 1990, items 406-408,530-534. "Frank Lloyd Wright and Madison: Eight Decades of Artistic and Social Interaction" Holzhueter, Hamilton,1990, page 37, 60, 66-67, 86, 97. Edited and Photographed: Futagawa, Yukio, 1990, page 56. "Frank Lloyd Wright Retrospective" Mainichi, 1991, page 130-136. "Frank Lloyd Wright" Pfeiffer, 1991, page 88-91. "Frank Lloyd Wright, A Primer on Architectural Principles" McCarter, 1991, page 137, 139, 193, 201-204. "Frank Lloyd Wright Remembered" Meehan, 1991, page 202-203, 224. Edited and Photographed: Futagawa, Yukio, 1991, page 238-265. Edited and Photographed: Futagawa, Yukio, 1991, page Cover, 108-131. "Frank Lloyd Wright Between Principle and Form" Laseau, 1992, page 23, 123, 155, 187. "Frank Lloyd Wright" McDonough, 1992, page 63-65, 67. "Frank Lloyd Wright: A Biography" Secrest, 1992, page 214, 216, 221, 233, 254, 256, 372, 480. "Frank Lloyd Wright Collected Writings - Volume 1" Pfeiffer, 1992, page 134-135, 287. "The Wright Style" Lind, 1992, page 194, 213. "Frank Lloyd Wright: The Masterworks" Larkin, Pfeiffer, 1993, page 108-111. "Frank Lloyd Wright, American Architect for the Twentieth Century" Sommer, 1993, page 89. "The Seven Ages of Frank Lloyd Wright: A New Appraisal" Hoppen, 1993, page 42-43, 46, 85. "Frank Lloyd Wright" Hart, 1993, page 18, 20, 68-69. "The Frank Lloyd Wright Companion", Storrer, William Allin, 1993, page 181-183. "Frank Lloyd Wright Glass Art" Heinz, 1994, page 160. "Frank Lloyd Wright’s Lost Buildings" Lind, 1994, page 38-44. "Frank Lloyd Wright: Architect" Riley, 1994, page 23, 36-39, 50, 53, 63, 65, 68, 167, 176-182. "Frank Lloyd Wright and the Meaning of Material" Patterson, 1994, page 112, 117, 119, 122, 164, 182, 187-8. "The Prairie School: Design Vision for the Midwest" Twombly, 1995, page 82, 108-110, 144. "Frank Lloyd Wright’s Dining Rooms" Lind, 1995, page 16-17, 48, 50-51. "Frank Lloyd Wright Architecture Collection" Treiber, 1995, page 50, 69-71. "Frank Lloyd Wright Design" Costantino, 1996, page 58. "Frank Lloyd Wright, Force of Nature" Nash, 1996, page 37, 42. "Lost Wright", Lind, Carla, 1996, page 122-125. "Frank Lloyd Wright: Maverick Architect" Davis, 1996, page 58-60. "The Architecture of Frank Lloyd Wright" Levine, 1996, page 105-107, 119, 121, 135, 316. "Frank Lloyd Wright: A Retrospective View" Copplestone, 1997, page 49-51. "Usonia, Frank Lloyd Wright’s Design for America" Rosenbaum, 1997, page 42-43, 127, 169. "Frank Lloyd Wright America’s Master Architect" Smith, 1998, page 110-113. “Frank Lloyd Wright and Midway Gardens”, Kurty, Paul, 1998, 262 pages. “Frank Lloyd Wright - The Lost Years”, Alofsin, Anthony, 1998. "50 Favorite Rooms By Frank Lloyd Wright" Maddex, 1998, page 104-107. "Frank Lloyd Wright" Copplestone, 1999, page 40-41. "Frank Lloyd Wright Quarterly", Spring 1998 Vol. 9 No. 2, page 20. 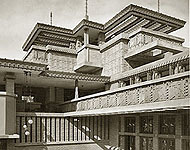 "Frank Lloyd Wright" McCarter, 1999, page 120, 128, 138-146, 149, 155, 163, 233, 335. "50 Favorite Furnishings By Frank Lloyd Wright" Maddex, 1999, page 34-35, 38, 86, 108, 112, 115-116, 123. "The Vision of Frank Lloyd Wright" Heinz, 2000, page 30, 32, 166, 301-303, 309, 411-412. "Frank Lloyd Wright’s Stained Glass & Lightscreens" Heinz, 2000, page 102, 104, 107. "Light Screens: The Leaded Glass of Frank Lloyd Wright" Sloan, 2001, page 128-130. "Frank Lloyd Wright’s Public Buildings" Heinz, 2002, page 24-26, 36, 42. "Frank Lloyd Wright’s Interiors" Heinz, 2002, page 45. "Life & Works of Frank Lloyd Wright" Heinz, 2002, page 29, 32, 170, 313-317. "Wrightscapes" Aguar, 2002, page 165-169. "Frank Lloyd Wright: The Interactive Portfolio", Stipe, Margo, 2004, page 34-37, plus three pieces. "﻿The Wright Experience, A Master Architects Vision" Hunt, 2008, page 10-12, 47, 62.